Sadly, the final evening of ad:tech San Francisco came to a close. A stellar yet bittersweet close, the evening began with a fabulous party put on by DoubleClick at the W Hotel during which Cirque du Soliel-style dancers contorted, twirled hula hoops, danced, mimed, posed, postured, walked on stilts and generally provided the audience with first class entertainment. Perhaps some of that Google money is already finding its way to DoubleClick's coffers. We're also quite pleased with DoubleClick's recent re-branding which gives the company a refreshingly current look. After downing an apple martini handed out to all in attendance and accepting a Macallan 10 from friend and DoubleClick Research Director Rick Bruner, the night quickly got off to a joyous start. As soon as I took the first sip of the McCallan, my pants started vibrating and it was fellow ad:tech blogger Ana Yoerg letting me know she, along with Adrants' Angela Natividad and Marketing Experiment's Mike Palmer would be arriving soon. While I waited for the crew to show up, I spent time speaking with AdFemme's Lindsay Mure, beautiful strangers from the exhibit hall floor, Rick Bruner's DoubleClick Co-workers and, yes, the famous Lindsey Frankenfield of ad:tech's past. After all the ad:tech wannabe partiers gave it their best shot to get into this invite only party, the crowds thinned enough to make social fluidity far more enjoyable than an ad:tech New York Crobar party. 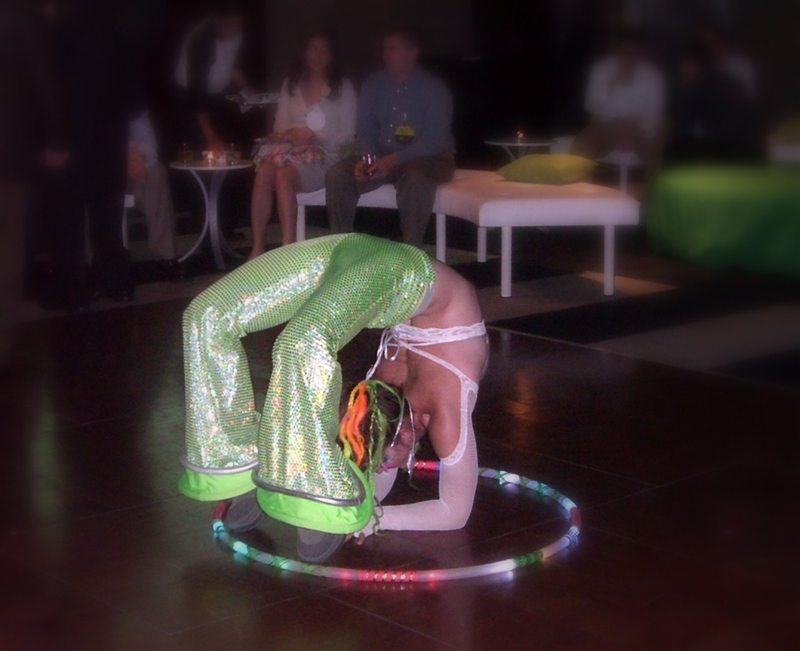 At the outset of the party, the hula hoop girl took the dance floor and performed all manner of contorted hula-isms which made one want to call in a chiropractor stat. Later in the evening, the floor filled with the full-on Cirque du Soliel-style dance troupe which kept the crowd so entranced, the line at the bars diminished to near none. While I'm still trying to get the image of a woman who passed me by in the exhibit hall blatantly picking her nose out of my head, let's turn attention to more important matters: The Girls of ad:tech. Yea, yea, yea. Booth babes. Booth dudes. Who cares? But it's my job so I'm obliged to bring you the spoils of my excursion through the ad:tech San Francisco 2007 conference exhibit hall Wednesday. 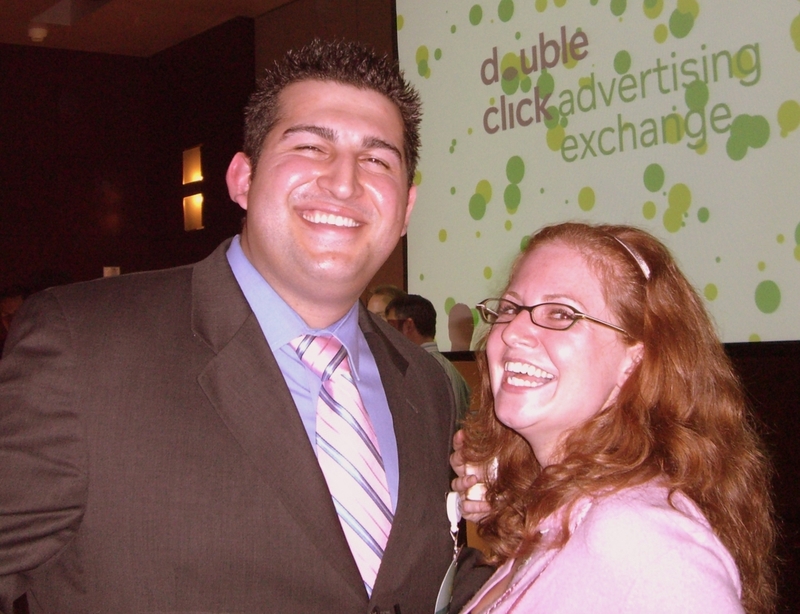 After all, ad:tech is the largest online marketing conference in the world.What happens at ad:tech gets blogged on the ad:tech blog. Anyway, after the recent bit on Adrants about Nair's resurgence of it's short shorts theme, it was a delight to see the very beautiful ClickSector girls decked out in full-on late seventies gym shorts obligingly posing for the camera. Thanks ladies. Then, gracing the main thoroughfare of the exhibit hall, the stunningly curvaceous and very beautiful CPXinteractive girl instantly attracted every passing man's eyeballs to her magnificent shapeliness (the 2D picture does not do justice to her very 3D attributes) which her spaghetti strap dress struggled, failingly, to restrain. Observing the spectacle, man after man after man after man stopped, stared, smiled, pretended not to look, pretended again not to look, looked and then just gave up and looked. I think I was in high school when, perched on a stall and unable to leave because my teachers were sinkside discussing how hot my dad was, I realized bathrooms are considered a sanctioned space. Their walls are keepers of myriad secrets. Since then I pay close attention to what's happening around me when I visit a loo to relieve myself. You'd be surprised what you discover. When people walk into a bathroom together, their voices actually get louder, daring the porcelain gods to reveal their covert conversations. And they talk about everything - power players, whose company will sink or swim, and why Monsieur CEO really left the agency. Well, here's some news. Contrary to popular convention, the stalls have ears. And if you've just nailed an awesome lead worth hundreds of thousands of dollars by sleeping with the CFO you met at Mighty last night, you probably shouldn't be standing at the sinks with your hotpants-sporting amigas parsing out the gritty (but triumphant!) details. Lesson 1 learned at ad:tech: The stalls have ears. 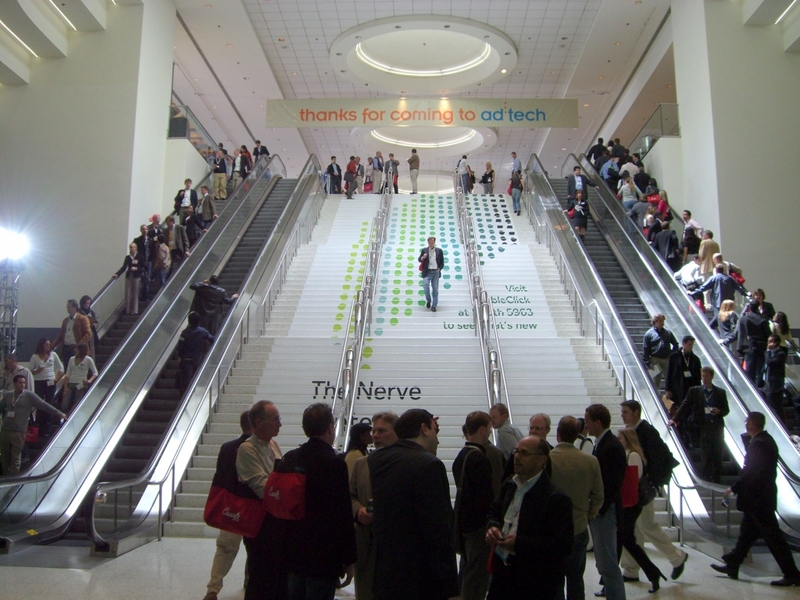 Tuesday night's activities at ad:tech San Francisco were subdued, enjoyable and ended oddly. Once the session rooms cleared and everyone began discussing where they'd eat dinner and what they'd be doing before they went to bed, we pulled out our trusty party schedule and headed over to the W Hotel's XYZ Lounge for the Boca Networks Party With A Star Party. Snooze. Though there was one bit of small amusement. apparently, there must have been a CIA agent there because when we lifted the camera to take a random crowd shot said agent turned her head away from the camera faster than an ad:tech booth babe gets accosted by drooling conference attendees. The look we received post flash was piercingly less than happy. Oh well. No visual fame for this CIA agent. On Wednesday night, the second night of the ad:tech San Francisco 2007 conference, the party schedule was packed. I'll tell you right now, we didn't make it to all the events but we'll give you a taste of the ones we did. After weighing in on the best exhibit hall schwag, Angela and I found ourselves at the ad:tech Awards Show, an event held in one of the very large Moscone North rooms near the exhibit hall. 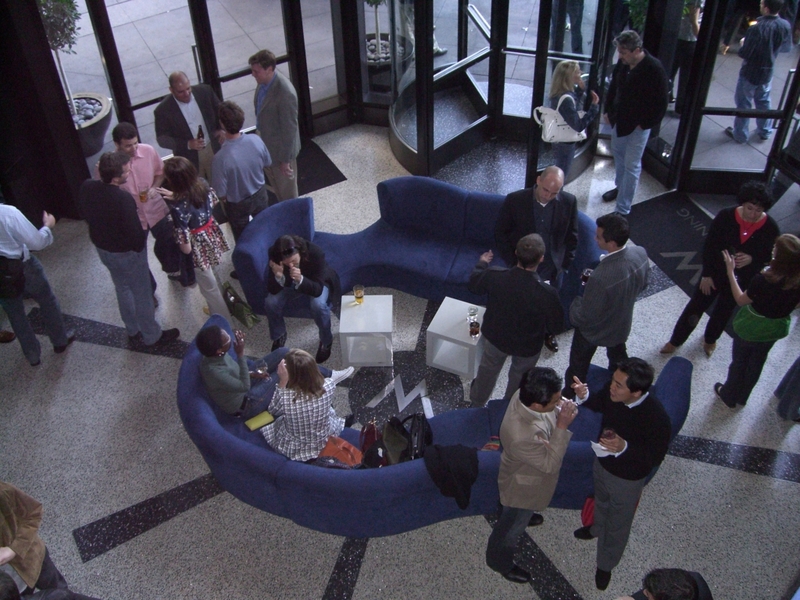 The event was well attended with open bar for three hours, cozy couches on which to site and a healthy supply of food. We particularly liked the mini burgers - perfect chow after hours of exhibit hall shenanigans. Cirque du Soliel was the centerpiece of the event with two spectacular performances surrounding the presentation of the actual awards by ad:tech Chair Emeritus Susan Bratton, eMarketer Co-Founder and CEO Geoff Ramsey introduced by ad:tech VP Don Knox. Following the first performance of Cirque du Soliel, which the audience loved, Knox took the stage and suffered dead mic syndrome for a minute or two. Making light of the situation, Knox called out to the techies in the background who, for some reason, couldn't find the "on" switch for Knox's mic. No matter, Knox exuberantly mastered the stage as he reviewed ad:tech's recent accomplishments and activities and then turned the stage over to Bratton and Ramsey. 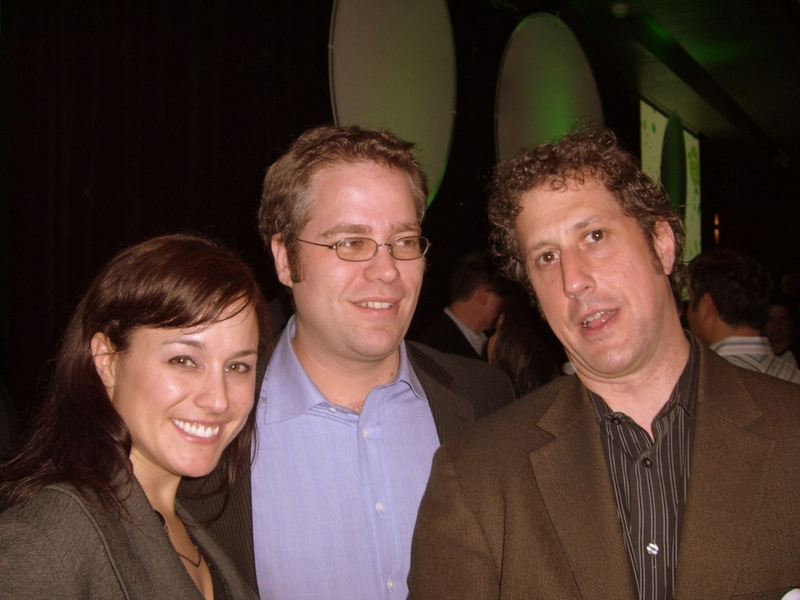 Now here's where we have suggestions for future ad:tech Awards events. The presentation - more a collection of quickly-paced announcements - flew by which, perhaps, had to be the case due to time constraints. Angela and I, having seen many other ad-related awards presentations, would suggest the finalist's creative, rather than just the campaign name and agency, be shown. Some creative was, indeed, shown but not for all categories. Secondly, and we're well aware this would lengthen the show tremendously and perhaps too much so for the purposes of the event, we'd suggest the winners of each category take the stage as they do at many other creative award shows so as to bask in the glory of their accomplishment and receive the adoration of their industry peers. After all, everyone in advertising needs their ego stroked from time to time.